"Why is 'no deal' such a big deal for UK-EU trade? ", asks Tommy Stubbington, economics correspondent of The Sunday Times in an article (no paywall) warning us that: "A hard Brexit with longer customs checks could cause traffic chaos". This is supposed to be an "explainer", telling us mere mortals why a "no deal" is such a bad idea, but we are also dealing with witless hacks, the very same who made such a complete mess of trying to explain what a customs union was, and its effect on UK trade. It would be too much to ask, therefore, that a mere Sunday Times journalist could begin to get it right and, in this at least, we not disappointed. Like the rest of those in his business, we find he hasn't got a clue. 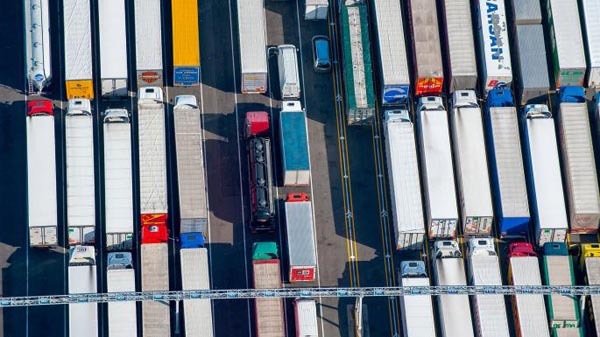 According to Stubbington, the reason why we are likely to face gridlock is because "about 70 percent of EU trade enters or leaves Britain in the back of a lorry, unlike the containers of goods that arrive from farther afield". Actually, it's closer to 60 percent but if we let that aside, we are led to believe that the problem, as we supposedly adopt WTO rules, is a combination of the speed of throughput and the upsurge in customs "paperwork" which will need to be processed. The reason why these mythical WTO rules currently seem to work is supposedly because, at the moment, they apply to container goods (lo-lo) rather that ro-ro. Containers arriving at a port such as Southampton have typically been at sea for days or even weeks, Stubbington says, and that is time that can be used to get customs paperwork in order. But lorries passing through Dover are stopped for an average of just two minutes for border checks. If that waiting time doubled, while paperwork is checked, the result would be 17-mile tailbacks across Kent. The trouble here is that we're taking about far more than 17-mile tailbacks. The most likely outcome is a near-complete seizure of the trade system. Stubbington's big problem, though, is that he has been talking to "experts" – the two of choice being James Hookham of the Freight Transport Association (TFA) and Joe Owen at the Institute for Government. This is one of the major weaknesses of the fourth estate. Instead of doing their own research – and then using experts to guide and explain – they use them as sources, even though oral testimony is notoriously unreliable. But the defect is compounded by the choice of "expert" being made on the basis of familiarity and prestige, rather than actual knowledge. For instance, when I spoke to the FTA, they were not even aware that a large proportion of the freight passing through to France would have to be presented to Border Inspection Posts. Still less were they aware that there is a massive shortfall in capacity, and that there is no BIP in Dover, to where the bulk of cargoes are routed. As for Joe Owen, his only claim to fame (and supposed expertise) is the production of an inadequate report on customs policy, his previous experience having been in "digital government and departmental transformation research". Upon these two unlikely props, however, Stubbington bases his evaluation of a complex issue, where he starts under the false impression – gained from "advocates of a clean break from Brussels" - that WTO rules already govern the majority of world trade, and close to half of Britain's". Thus, the framing we get from this Sunday Times hack is that: "If goods headed for New York or Hong Kong are already subject to lengthy customs checks, why is it such a headache to apply the same system to shipments bound for Calais or Rotterdam?" To say that this framing is crass is an understatement. In fact, the bulk of goods shipped from destinations such as China and the United States into the UK do not undergo "lengthy customs checks" on arrival at the UK. Many of the goods routed through "trusted traders" can be shipped out of the docks almost immediately they have been unloaded, with minimal formalities. The issue is not WTO rules at all. In addition to the basic WTO framework, countries have concluded multiple agreements with the EU, and especially customs cooperation agreements based on the World Customs Organisation (WCO) template. It is these deals, which transcend WTO rules, that enable a relatively free flow of goods through the ports. As for the UK and Brexit, if we leave without a deal, we will have torn up all the agreements between the UK and the EU and failed to replace them. That is the issue. It is not the difference between countries which have no deals with the EU and are trading under WTO rules. There is not a single major developed economy which trades with the EU on this basis. The problem thus will arise because, when the UK leaves the EU it becomes a third country, subject to the full regime of all the laws applicable to third countries, without the mediating effect of administrative agreements easing the flow of trade. It will only have the WTO to rely on, and that is not anything like sufficient. Yet still, Stubbington is going on about the "fivefold increase in the number of declarations" which have to be processed by HM Customs. "The government estimates that there will be an additional 200 million customs declarations after Brexit, up from 55 million at present", he bleats, as if this really mattered. Nor is it particularly relevant to write of HMRC needing to hire "several thousand" new officials if it subjected EU trade to the same checks as non-EU trade. This is according to "expert" Owen who also suggests that "extra specialists who check everything from animal health to rare art would have to be found". Time and time again, however, I've pointed out that the main choke points are the other side of the Channel as UK exporters seek entry for goods into the markets of EU/EEA members. And there, sector by sector, there will be endless problems, many of which we have already rehearsed. If we play a little game of "compare and contrast", imagine an established US chemical manufacturer selling goods into the EU. In order to operate, the company will have appointed in the territory of one of the EU Member States an "only representative" as required by the REACH regulation, and then secured registration of all those products which will be exported. What gets this company access to EU markets, therefore, is not WTO rules but compliance with specific EU legal requirements, as applied to "third countries". Now compare that with a UK chemical company on the day after Brexit without a deal. The UK government not having made covering arrangements, this company will find that its existing chemical registrations are no longer valid. Anything produced in the UK under the authority of those registrations will be refused entry. The company will have to appoint its own "only representative" and go through the necessary procedures before its products will be accepted for free circulation within the Single Market. The point – which will apply to so many other products, from foodstuffs to parts for lifts and escalators which a company might already have installed – is that established third country suppliers will already have the systems in place which allow them to trade. The UK, having broken out of the EU acquis and walked away without a deal, will be starting from scratch. Before any sector-specific issues are considered though, the UK will have to negotiate with the EU a comprehensive customs cooperation agreement, which will include mutual recognition of each other's Authorised Economic Operators (AEOs). The UK will also need a Mutual Recognition Agreement (MRA) on conformity assessment, without which none of its testing certificates will be recognised and no end of products will have to be tested at the border. Having walked away, though, one cannot see how the EU would be in a position to make any agreements. Here, "no deal" means "no deal". You cannot tell the EU we're not having an Article 50 settlement and then come crawling back to discuss customs cooperation and mutual recognition of conformity testing. We will find ourselves presented with just the same issues our negotiators have walked away from. But, with that, it would be wholly wrong just to pick on Tommy Stubbington. He is by no means alone. His colleague in arms, Henry Zeffman, a "political reporter" writes a dreadful piece headed: " Splendid isolation or madness? What hard Brexit means", an event which has him looking "at the consequences across all areas of life" of a "no deal" Brexit. Following an embarrassingly superficial exposition in the effect on ports, Zeffman supposedly deals with medicines, telling us that there "would be huge issues for pharmaceutical companies based in the UK, which would not be able to have their products licensed for use elsewhere in the bloc". This, of course, is the least of their problems for the moment as all the existing products, where market authorisations are held by UK companies, will no longer be released for free circulation within EEA territories. The companies will have to go to the enormous expense of transferring market authorisations to EU-based entities, until which time there will be no exports. Animal products can be exported from a country with which the EU does not have an agreement at only specific inspection points. The two most accessible from British ports are Le Havre and Dunkirk, but they would need major upgrades to check products at present exported from the UK. Regular readers, though, will notice the error: animal products from any third country – irrespective of any trade agreements with the EU – have to be submitted to "specific inspection points". And, as it stands, it might take several years for the facilities to become available. Crucially, though, Zeffman writes: "There would not be food shortages, but there would be huge ramifications for the pricing and availability of different foodstuffs". And that is somewhat optimistic. It neglects the point that, if the UK maintains its current third country inspection regime, after Brexit, it will have to apply the same regime to EU imports – to avoid falling foul of WTO non-discrimination rules. Without the facilities to do so – which could take some years to build - there most certainly will be a shortfall in the goods coming from the EU. Whether we can make up the losses is an open question but the best guess is that there will be substantial food shortages in the short- to medium-term. In this, what all these people are missing is the dynamic which is going to bring trade to a halt, and have us going hungry. And it is not as if this is an unknown quantity – in August last year, changes to the security system at the French ports led to massive queues on the roads to Dover. The reason we are going to see the problem if there is no deal is that many of the products which are currently freely sold to the EU Member States will no longer qualify for entry. In anticipation of this (and in any event in respect of animals and food products), there will have to be a high level of inspection of vehicles arriving at EU Member State ports. Then, as the traffic slows in the ports, the very limited waiting areas will fill up and the ports (including the Channel Tunnel terminal) will seize up. This means that the transports (ferries and trains) will be unable to discharge their loads. And it is at that point that, on the other side of the Channel, things will also start to slow down. With no transports, waiting areas will fill and, as the ports become congested, the queues will start to build up. This has nothing to do with the WTO and its rules. Exporters seeking entry of their products to EU Member States must apply EU rules. And, in many instances, the UK as a newly created "third country" will simply not have the paperwork in place. Should negotiations continue, there will doubtless be interim arrangements that can be agreed which will ease the problems – although not eliminate them. But the "no deal" scenario is "sudden death". No organisation can take the shock of the complete abolition of all the systems in force and keep running. If we drop out of the EU without a deal, trade will slow to a mere trickle – if, indeed, any continues. And yet, for all their resources, their access to so-called "experts" and the availability of all the information one could possibly need, the media can't work this out. No more so than the idiot Grayling, who suggests that farmers should "grow more food" in the event of supply interruptions, does the media have any touch with reality. Both seem incapable of working out from basic principles the likely outcome of a "no deal" Brexit. One can imagine that, if we do drop out without a deal – and that looks increasingly likely – it will all come as such a shock to media and politicians alike. But saying "I told you so", will not be enough. To avoid real suffering, somehow we need to get through to these stupid people, before it is too late.